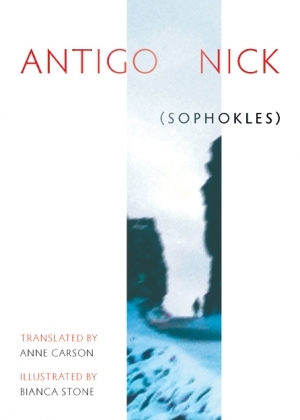 Anne Carson staged a reading in Ann Arbor from her new book Antigonick this past Wednesday. It’s a loose translation of the Sophokles play complete with Carson’s own handlettered pages interspersed with illustrations on translucent vellum by Bianca Stone (a fabulous poet and artist I am just learning about. If you’d like a quick taste go here to her Poetry Comics). Both the book and the staged reading are arresting and beautiful in their surprises. During the question and answer session after the performance, Carson said one of her translating missions was to “remove the crusts of ornament” in order to present the play more directly, in the way it reads in original Greek. Getting at this directness involved cutting several long scenes down, reimaging the genre of the play to the point that Antigonick is sometimes described as “a new kind of comic book” and adding references to Beckett, Hegel, and Virginia Woolf. During the reading I saw, Carson cast poet Raymond McDaniel as Antigone and Yopie Prins as Kreon, gender-switching the roles in a way that heightened my desire to listen. In this translation, Carson manages to put me on enough unfamiliar ground to rouse my curiosity and to experience this story as a struggle that has and always will keep going. Her mission to “remove the crusts of ornament” has also been resonating with me this past week. It seems like a relevant goal to strive for in the making of all art, that artists should examine and remove their ornaments whenever possible, and that this removal will illuminate what is (or is not) actually there. What are ornaments for writers? Pretty similes. Forced cadences. Unnecessary repetition. Unbelievable resolution. Affectation of all kinds. It is harrowing to think about my own writing against this measuring stick. When am I pretending at something I don’t have? When am I trying to cover this up with sparkles in the hopes that no one (not even myself) will notice? In The Winter Sun, Fanny Howe writes about our initial tendencies to use words to cover up deeper truths. Revision is suspicious of first words and assumes they exist only to signal something else, something deeper. I revise what I have written in order to strip away fraud and get to the uncontaminated first intention. By slashing the curtains of words, I might finally glimpse the words behind the words and the silence behind those. This is such a visceral and elegant statement on revision. “Slashing the curtains of words,” is exactly what Carson has done in this translation of Antigone, and the whole writing world would be much improved if writers devoted more time to this.